Dr. Thomas E. Rinderer, head researcher at the USDA's Agricultural Research Services, Honey Bee Breeding, Genetics and Physiology Lab in Baton Rouge, Dr. Robert Danaka, an entomologist, and Dr. Gary Delate, a technician initiated the research project to evaluate honey bees from the Primorsky region of eastern Russia for varroa mite resistance. The honey bees in the region had been living with varroa mites since at least 1952 and it was believed that they might be able to tolerate the varroa mite. In the fall of 1994, a preliminary fact finding mission determined that there was enough evidence and scientific support to initiate the project. 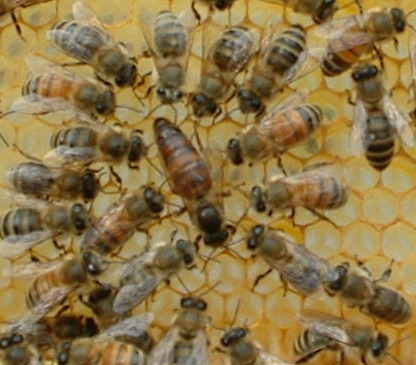 In June of 1995, a test apiary was established in Primorsky. Queens from 16 separate beekeepers in Primorsky were collected and brought to the Honey Bee Quarantine Station at Grand Terre Island, Louisiana in 1997. In 1998, daughters were raised from the queens and mated to drones from the Russian queens. The evaluation continued in secure apiaries near Baton Rouge. Hubert D.Tubbs Apiaries in Webb, Mississippi in winter of 2000 had an opportunity to witness the Russian bees' durability thanks to a harsh winter. Of his1,500 domestic colonies, 1,200 to 1,400 were lost, whereas of his 2,000 Russian-bred colonies, only 2 didn't survive. Based on test-yard evaluations, Tubbs reports average honey yields of 130 to 150 pounds per hive. The usual yield is about 84 pounds per hive in his area. There are 40 different, elite genetic lines of Russian bees. decided to import the Russian bee stock for initial evaluation as a source of Varroa resistance.